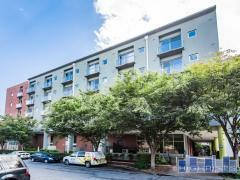 Piedmont Park West lofts sit right on the edge of Piedmont Park and are mere steps from restaurants, bars, and retail. These homes are spacious and feature large windows, 10' ceilings, French doors leading to private balconies and exposed ductwork. There's also a fabulous rooftop deck. Have any comments or questions about Piedmont Park West? Ask your question and/or share your thoughts about this Building.